I hung two stockings, one for a cat I’ll probably never see again and another for my baby (also a cat) visiting his grandparents in Texas. I wrapped gifts for Angel Tree children (all purchased from either small or black-owned businesses to support the #NotOneDime initiative while brightening some kids’ holidays) and a few more for three others I may or may not have the chance to see this holiday. I made too-rich giant stuffed cookies (chocolate with sea salt and dark chocolate truffle centers) and a potato-based dip, except I doubled the potatoes and forgot to double the cream, so it’s more like a salad than anything. I cleaned my living room, my bedroom, my bathroom, and kitchen, and then decided to cut more of my hair off (there goes the bathroom), cook, and wash my sheets. I’ve run out of steam temporarily to amend those places now so quickly remessed. I showered and put on patterned cozy pants (although there’s hearts on these – no holiday theme there), donned my batman robe and then plopped onto my freshly clean futon turned daybed (it’s stuck) and looked around. The place looks better than it has in months, smells warm, and even my holiday playlist was still going, courtesy of Amazon Prime’s music player. There ended my holiday participation. I cut on my laptop, switched over to the likes of Echosmith, The Cranberries, Oasis, and Lauryn Hill and searched for updates on the situation surrounding Antonio Martin in Missouri. I ate a single cookie, cleared out my spam folders, and shot and published more selfies than should be legal due to aforementioned hair cutting. What else does the soloist do for the holidays centered on spending time with loved ones? It’s not that I am a complete loner in this life – despite three hours between myself and my nearest extended family members and a dissolved marriage, I am blessed to encounter the best people and call them my friends anywhere I go. However, when those friends are made in as transient a city as Washington, DC, the holidays tend to find more people going out than in, excepting the native loves I have, whom all have their own families. My immediate family lives in Texas and this is my third year on the east coast for this holiday. I had originally planned to visit home, but when I would have been buying the tickets (mid-October), I realized both that it wouldn’t be financially safe to do so with my other travel plans laid out for 2014; I also saw me trying to move soon and decided I couldn’t spare a week in Philly with my uncle’s family either. Admittedly too, at the time, staying in the area didn’t sound too bad – I had a friend that would be in town and thought maybe sometime over the two week break we could spend some time together and I would forget on the other days how boring it is to be home all day. Ambitious thoughts then and, halfway into the two week break, I feel perhaps it is still an ambitious thought. 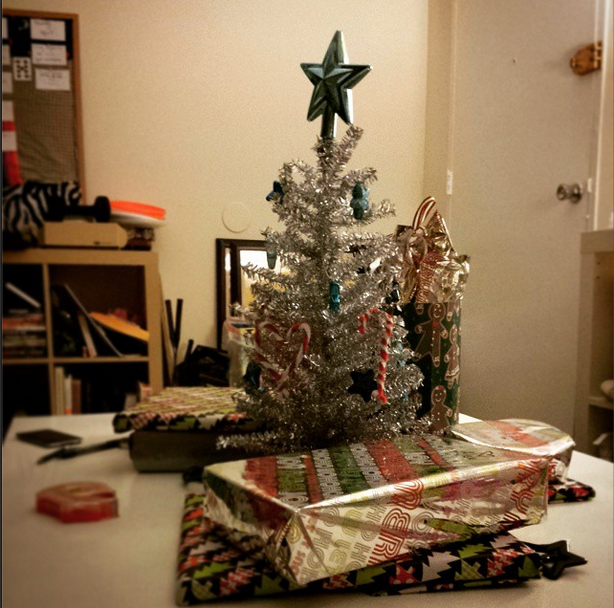 Before I began harassing instagram with a barrage of my filtered face, I had shared a photo of my tiny foot-high tree and the gifts surrounding it. I thought about what will surround my tiny tree next year – who I’ll still have in my life that I’ll want to give gifts, if my cat will have another companion to wrestle the tree over with, what state or country I’ll land in… and I found myself not longing wistfully to be sharing the holiday with someone as much as I was simply grateful for the many days this year and those prior I have been able to share any day with someone. In my own way, I am celebrating. I celebrate having time and a home for myself. I celebrate the future and possibility. I celebrate food to cook and a warm blanket and good health and self love. In the midst of it all, too, I am still reflecting and continue celebrating the absolutely incredible year I’ve had and that’s greater than any gift anyone could put into a box. Although the focus of this holiday is (rightly) placed on spending time with those you cherish, we have to acknowledge it isn’t always possible – best friends move, families grow in their own directions, some bonds even fall apart, and sometimes we just can’t make it and have to pray next year presents an opportunity; but not being physically present doesn’t mean my family and friends are any further from my mind or my heart, and, in fact, maybe are a little closer for all the time I have to revisit memories we built. I am 25 and alone on Christmas eve, but I am not lonely. The season is no less beautiful for it – I have so much to celebrate. So, I raise my eggnog (I’m a sober soloist) to you and your own version of celebration – because if you’re reading this on your holiday, you’re probably alone too. Embrace it. Celebrate yourself and those that contributed to you this year. Next Post love does not exist in this world where people live by fear and ego.